So how did the weekend go? Super busy on my end. Saturday I headed over to Holly's early after a healthy dose of coffee. We needed to get some photos of the finished quilt. I can't wait to share that quilt with you, it's really great. I got to see some of the fun things she's working on and I'm dying over them, and I really can't wait to share them with you. I think working in her new space really has supercharged her creativity. I had some easy fun sewing too. I had this little idea for a bag and it worked out pretty good I think. I remember having a bag like this for my jacks. I loved to play jacks for hours. My mom taught me, and she was awesome at it. We had those little metal jacks and a red ball. Now they have the very cheerful plastic jacks, also cute but how the heck to you scoop up all those in one hand? Anyway, I love the little bag, and I've filled it with some goodies, no jacks though, and have it ready to send off to a friend. It was totally some happy sewing fun. "I love the block. I love all the wonderful things you create. Congrats on being in the magazine. Thanks for a wonderful giveaway." Email your mailing address to me Laurie and I'll pass it along to Quiltmaker ! Thanks everyone for your nice comments and of course for the time you spend here with me! You friendship, support and encouragement are wonderful! Such a very cute bag Pam. Sometimes making these small little gifts is the best kind of sewing. Have a great week, looking forward to all the fun reveals! Your bag is super cute! I loved playing jacks. Cannot wait until PKGarden is here! Again we are the same. My mom taught me to play jacks too. I loved it and would play for hours. 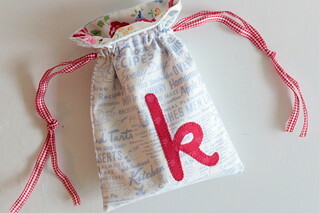 Super sweet little bag. 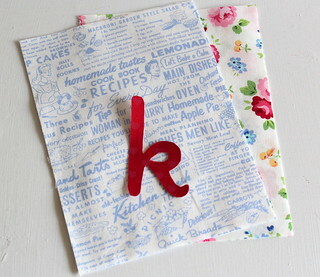 I love little bags made with amazing fabric. Metal jacks and that red rubber ball...SO fun! Adorable little bag you've made...clever girl! JACKS!!! I LOVED Jacks too -- and my mom was great at it too -- maybe they played each other! We should play Jacks at Market LOL! Your bag is adorbs. Can't wait for the big reveal!!! !